Not only can you live happily every day, bestselling author Joel Osteen suggests you must discover the potential within yourself and learn how to use it to live better, and to help others better themselves as well. God didn't create you to be average. You were created to excel! You have everything you need to fulfil your God-given destiny, and there is no limit to what you can accomplish if you discover how to be a better you! 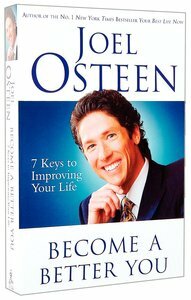 In Become a Better You: 7 Keys to Improving Your Life Every Day, Joel Osteen, America's best-known pastor, will inspire and motivate you to live with more joy, hope, and peace - truly a life of victory! Joel will help you look deep inside yourself to become a better spouse and parent, a better boss or employee, a better community leader, a better friend - in short, a better person! Joel Osteen reveals seven simple yet profound principles that when taken to heart will help you become all that God has created you to be. In a straightforward, easy-to-understand style, Osteen explains key biblical values; the text is laced with personal testimonies that will enlighten and uplift you. Each of the seven keys has its own section, complete with a set of practical action points. Thus Become a Better You will guide you in the process of uncovering your hidden resources. Within these pages, Joel Osteen addresses topics such as building your confidence, developing better relationships, finding peace within, and staying passionate about life. Become a Better You will encourage you to reach your unique God-given potential, and will help you to enjoy every day of your life, despite your circumstances. As you incorporate Joel's easy-to-grasp principles into your life, you will be pleasantly surprised at how much more God has in store for you, and how quickly you become a better you! About "Become a Better You"
Incorporating biblical lessons with personal stories, the bestselling author of Your Best Life Now offers seven action steps to help readers discover the better things they have been born for--their individual purpose and destiny.